Follow Tom at Stalba Motorsports! After what could be called a rough start to the 2014 season, Tom Stalba had a weekend that most can only dream about. Due to rain, the Lucas Oil Drag Racing Series Atco Divisional points race was postponed 2 weeks and was finished on Friday of the Cecil County Divisional. Tom was still in competition in both his ’63 Corvette Roadster in Super Gas and his Undercover Dragster in Super Comp. Tom’s concentration and the mindset to just have fun paid off. He won in both classes for a rare “double-up” for the Atco Points race. Then two days later, he proceeded to win in Super Comp for the Cecil County Points race win and the even rarer “triple-up.” Tom was not feeling well Saturday, and it showed in eliminations with his reaction times, which gave him a first round loss in Super Gas, although he had a lucky round in Super Comp and made it through to Sunday eliminations. Tom was in the zone all day and all weekend, winning 14 straight rounds of competition in his dragster. Earlier in the season, Tom was driving for Greco Racing in Comp Eliminator, but after mutual decision, Charlie Greco wanted to drive his own car again, and Tom decided he missed his roadster and started driving it again at the Lebanon Valley Lucas Oil Drag Racing Event. First race out with the Corvette and he won the final there and the momentum kept up at the New England Dragway points race, where he lost in the final to Mike Sawyer. Tom even got back into some bracket racing at the Atco Raceway Superbucks weekend, where he went late rounds in two cars, and was a semi-finalist in Sunday’s $25,000-to-win race. Next up, Indianapolis for the U.S. Nationals and then on to Englishtown for the Division 1 points race. From there, Tom plans to attend the points race in Reynolds, GA, the National Event in Charlotte, NC and the National Event at Maple Grove, PA. Depending on how those races go, he may travel further if he has a chance at a National Title in either class. Tom relies on Lucas Oil Products, Hoosier Tires, K&N Filters, Autometer, VP Race Fuels, and Sunset Racecraft to provide him with the tools he needs to keep his cars consistent and safe every pass. He would also like to thank the group at A.A. Auto Salvage, Inc for keeping things running smoothly while he is away. For more results and stories, check out these links. After a tough start to the 2013 season in all three classes he competed, Tom Stalba found his way to the final round at his last 2 2013 events, including a Runner-Up finish at the Auto Plus Nationals at Maple Grove Raceway, and a Win in Super Comp at the Division 2 Lucas Oil Drag Racing Series Event in Reynolds, Georgia. Tom and the Charlie Greco team struggled to find consistency and suffered many transmission failures throughout the season but put together enough round wins for a 5th place finish in the Northeast Division. The team has regrouped and solved many of their problems and look to begin testing in Florida for 3 days on March 3, 2014. 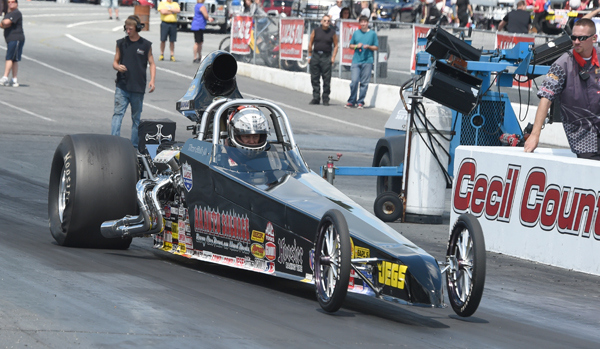 Tom will also compete in either Super Comp or Super Gas at races where he runs in Comp Eliminator. In addition to the great end to 2013 in the NHRA ranks, one of Tom's team cars driven by Brian Brown won a $10,000 Bracket Race at Atco Raceway the week following Reynolds. Tom was racing very well himself, however he lost in the 4th round when a wire broke off of his delay box. Overall, it was a great way to end the 2013 season and gain momentum for the 2014 start. Follow the team at Stalba Motorsports on Facebook to keep up with results as the season progresses! April 14, 2013: Tom Stalba made his debut in Charlie Greco’s Cobalt in Richmond, Virginia on April 12, 2013. The guys had a great outing, qualifying in the #15 spot out of 26 cars and made it to the semi-finals, by virtue of a couple of competition singles and a bye run. Tom’s first round opponent was unable to make the call, as was the second round opponent, and third round was a schedule bye run. Tom ultimately turned the red light on against Pat Ross in the semi-final round, however, it was valuable seat time and then team gathered a lot of run data to move on. Tom and the guys also set the record for the L/AA category that weekend at Virginia Motorsports Park, going 8.79 seconds at 142.43 MPH. Special thanks to Charlie Greco for the opportunity and to Bill and Nick Mayo, Larry King and Donnie for the support. Tom has a lot to learn in Comp but will get better every pass down the ¼ mile. April 28, 2013: Tom and crew made the journey to Indianapolis, Indiana with the Cobalt Tom and team qualified with a 0.609 under the index pass, going 8.731 on a 9.34 index. Although they qualified 1oth and had a great car, the rain came just on time for eliminations, and the race was ultimately postponed to the following weekend. Tom and the guys all went back to Indy, only to sit in the rain for another weekend. After a second race postponement, the team withdrew from the race as to not have it count towards season points and chose not to attend the Chicago LODRS event where the make-up was to be held. May 19, 2013: After qualifying success in indy only to be rained on, Tom and the team headed to the Summit Motorsports Park in Norwalk, Ohio for the Calvacade of Stars Lucas Oil Drag Racing Series Event. This outing proved to be somewhat challenging and the team struggled in qualifying to a 21st place effort out of 29 cars. After making several changes to the chassis and engine, the car was on a much better pass during first round, but some miscommunication and some inexperience on Tom’s part led to a first round exit. Although it was not the result the guys sought, the improved performance was encouraging. Tom continues to learn and has his mind set on improving in the car and the guys have their sights set on high performance in the near future. In the meantime, Tom brought his Super Comp dragster along for this event and made it to the quarter finals. Going some rounds brought back confidence for Tom and he is looking forward to more racing success in the near future. 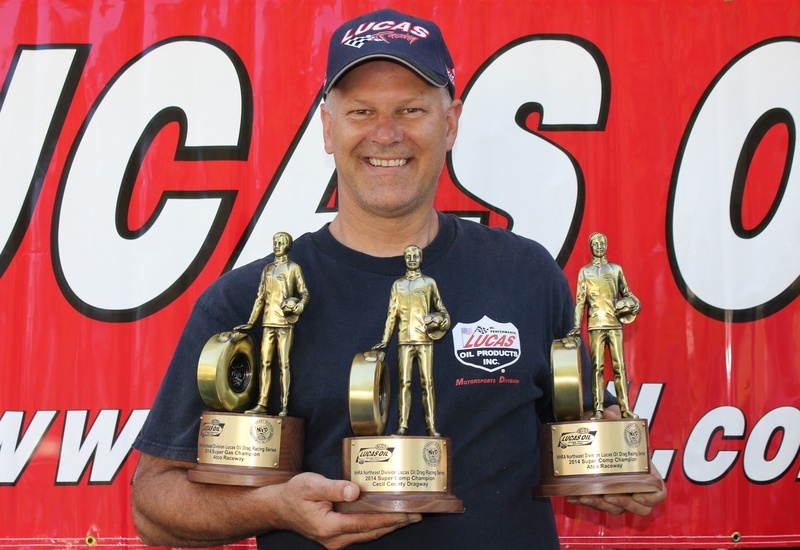 May 26, 2013: Tom Stalba has more Wallys from Maple Grove in his trophy collection than from any other track on the circuit, so he headed to Maple Grove with much optimism. He raced in Comp Eliminator again in Charlie Greco’s L/AA Chevy Cobalt and the guys gave him a car that was performing well. Tom qualified #8 out of 34 cars that made an attempt at the 32-car field on Memorial Day Weekend. A pass at 0.640 seconds under his 9.34 index had the team very excited. Tom had a close first round race against Kevin Gotie who did his best by cutting a super light against Tom, but Tom had the power to drive around him at the other end. Second round, Tom faced Ed Alessi Jr, and was able to win that round without taking any index penalty into third round. Once again, the red light bug bit Tom in round 3, however it was a good outing and the team will be making some changes to help Tom with his reaction times and comfort level in the car. All in all, it was a great performance weekend and the team was very optimistic going into the Summernationals in Englishtown, NJ. Tom did have his Super Comp Dragster at this event, but unfortunately lost in the second round. Stalba’s wife Karen had what could be a turnaround in her A/Fuel Dragster, qualifying 3rd out of 18 dragsters for an 8 car field, and lost in the semi-finals. Hoping for a Stalba Triple in Lebanon Valley, New York, which is the next time the husband and wife team will be competing at the same event. June 4, 2013: Tommy, Charlie and the guys tried weathered the heat in Old Bridge Township Raceway Park at the 44th Annual Summernationals and ran a pass of 8.76 in the heat to qualify 4th out of 33 cars making the attempt at the 32 car field. Tom has been struggling in the car as of late so when he won first round in Comp he was very excited and felt the team had a car that could go all the way. The excitement didn’t last long, for Tom lost to Chip Ippolito in round 2. Tom was behind at the starting line and the car fell off mid-track which allowed Chip to come around for the win. Tom had success in his 1963 Corvette Super Gas Roadster, making it to the semi-finals before losing to eventual first time National Event winner Tom Goldman. The guys have been working hard and Tom is confident that he will be able to bring them a win in the very near future. Next stop: Lebanon Valley, New York for the Lucas Oil Drag Racing Series event. Follow along @KarenStalba on Twitter or Stalba Motorsports on Facebook where Tom’s wife Karen will be posting race updates in between racing her A/Fuel dragster and feeding the army! Thanks for your visit, come back soon! Tom Stalba hadn't planned on racing in 2013. He planned to spend some time on other interests and take a well deserved break after many years chasing points and traveling the country. That changed pretty quickly after he was offerred a ride in Charlie Greco's L/AA Competition Eliminator ride. It was an offer he was torn over taking only because he had decided to slow down, but opportunities like this don't come often. Tom decided to take Charlie up on his offer and the team will start the 2013 season in Richmond, Virginia at the Division 1 points race.